During the decade of the 1980s, activities in Cuba’s agricultural sector were conducted under a state extensive growth model. Sugarcane agriculture was no exception. At the end of the decade, however, there were signs of the exhaustion of such model, which was transformed into one based on a new form of production called the Basic Unit of Cooperative Production (Unidad Básica de Producción Cooperativa, UBPC). The objectives of this paper are to describe and analyze the main characteristics of (a) the state extensive growth model applied to the Cuban sugarcane sector until the end of the 1980s and the reasons for its failure; (b) the status of the sector during the 1990-93 period; and (c) the changes taking place at present in this sector and the potential for their success. The decade of the 1980s was a period of expansion and development for the Cuban sugarcane sector. In fact, the indicators of area under cultivation and harvested area, and the corresponding volumes of production and value, show considerable growth when compared with previous decades (CEE, Anuario Estadístico de Cuba). They are also, on the average, the highest of Cuba’s sugarcane agricultural history. The basic characteristics of the state extensive growth model applied to sugarcane agriculture in state farms were: (a) expansion of agricultural areas; (b) high capital investment; and (c) high use of productive inputs. Expansion of Agricultural Areas: Forty-three percent of the total 4.4 million hectares under cultivation in the country are devoted to sugarcane. No other crop has such an extensive area in Cuba. At the beginning of the 1980s, the area devoted to sugarcane was more than 1.6 million hectares (ha). About 250,000 ha were added during that period to reach 1.9 million ha in 1990 (Table 1). This continued increase in sugarcane agricultural area was tied to two factors: (a) the projected increases in production levels, and (b) the still low agricultural yields. On the average, sugarcane agricultural production showed a positive growth during the decade of the 1980s when compared with the two previous decades. Its annual indicator, however, was rather unstable (Table 1). This unstable behavior of sugarcane production was due, to a certain extent, to both epidemiological and climatic factors. In 1979, for example, rust severely affected the B-4362 sugarcane variety which, at that time, was planted in more than one-fourth of the cane area (Nova González, 1990, pp. 262-301). During 1980, it became necessary to replant the affected areas and substitute the Barbados variety for others more resistant to rust, which affected the 1979-80 and 1980-81 harvests (Table 1). Climatological problems had also negative impacts on sugarcane production. Out-of-season rains (related to the so-called Niño phenomenon) in 1983, and hurricane Kate in 1985, had negative impacts on the harvests from 1982-83 through 1984-85, leaving losses of about two million metric tons of sugar (Table 1). This was followed by two years (1986 and 1987) of intense dry weather with annual levels of rainfall of 970 and 1,215 mm, respectively, well below the country’s historical mean of 1,375 mm (Rodríguez Hernández, 1989, p. 24). Despite these problems, sugarcane production averaged 71 million metric tons during the decade of the 1980s. This was 28% above the average annual production for the 1970s and 54% above the results of the 1960s. During the 1980s, there was also a favorable balance concerning average sugarcane yields, although these continued to fall well below the agricultural potential of the country. Furthermore, and as explained below, the gaps between potential and actual yields were different at the provincial level. Average yields in the provinces of Cienfuegos, Sancti Spíritus, Santiago de Cuba, and Granma, with sugarcane shares between 4 and 7%, were always below 57 mt/ha, and around 48 mt/ha in the case of Sancti Spíritus. Pinar del Río and Guantánamo, provinces with average sugarcane shares below 3%, showed different performances. Pinar del Río ranked as a medium-yield province (58.6 mt/ha) with a minimum average potential of 71.4 mt/ha. Guantánamo, on the other and with a high minimum yield potential (above 77.3 mt/ha) only achieved levels below 46.6 mt/ha, which represented 40% below its minimum potential. When average agricultural yields for the 1981-85 (53.24 mt/ha) and 1986-90 (51.26 mt/ha) periods are compared, the drop of about 1.90 mt/ha becomes obvious. (A simple linear regression analysis shows average yields decreasing by 0.243 mt/ha from 1981 through 1990.) Therefore, average agricultural yields were not only relatively low but also showed a decreasing tendency during the 1980s. However, as already pointed out, the volumes of cane milled during this period were increasing at a rate of 0.292 mt, as shown by a simple linear regression model. This was only possible by increasing cane area and, above all, harvested area. In other words, the increase in volumes of sugarcane milled during the 1980s were the result of extensive plantings. 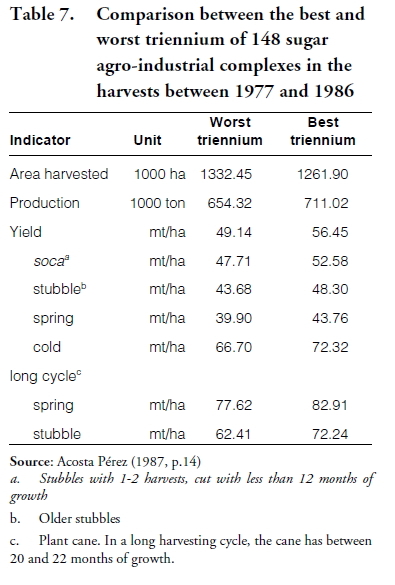 Other experiments conducted in Cuba between 1970 and 1985 give credibility to the possibility of achieving average yield levels above 67.2 mt/ha. All the experiments confirmed that, through the implementation of intensive cultural practices, and an efficient system of organization and management, it was feasible to achieve average country yields above 67.2 mt/ ha (Alvarez Dozáguez, 1993, p. 5). Faced with a rural labor shortage, it is not surprising that Cuban planners —like their counterparts in much of the developing world— became increasingly enamored with capital-intensive agriculture. With their emphasis on irrigation, mechanization, and the use of “up-to-day” technology, the Cubans have also concluded that capital inputs can best be introduced on large-scale units which allegedly afford economies of scale (p. 251). During the period 1981-90, total investments in the agricultural sector reached 7.9 billion pesos— 4.2 billion during 1981-85 and 3.7 billion during the remaining years (CEE, Anuario Estadístico de Cuba, 1989, p. 133). Such investments represented 20.3% of total investment in the country during this nineyear period. The investment level in the sugarcane agricultural sector during 1981-90 reached US$2.4 billion (US$1.3 billion during 1981-85 and US$1.1 billion during 1986-90). That figure accounted for 30% of total investments in the agricultural sector during the ten-year period. In relation to the 1976-80 period, during which investments in the agricultural sugarcane sector reached 987 million pesos, the increase in 1981-85 was 30%. The continuing investment growth pattern is also observed in the last four years at the end of the 1980 decade for which data are available. In fact, average annual investment per year for the period 1981-85 was 264.5 million pesos, and 271.8 million pesos for each of the remaining four years (CEE, Anuario Estadístico de Cuba, various issues; Anuario Estadístico MINAZ, 1990, pp. 156, 247-255). Although the investment flows for the sugarcane agricultural sector during the decade of the 1980s were high, the efficiency of the investment process was insufficient, as shown by the following facts. First, despite the increase in investment, the value of gross production did not increase. The annual average of the value variation of sugarcane production/investment indicator (dvp/inv) for the years 1980-89 was only 0.05 pesos. In other words, for every peso invested in the sugarcane agricultural sector during that period, the value of production only grew an average of 5 centavos (Alvarez and Peña Castellanos, 1995, p. 9). Second, when this indicator is analyzed for variations in milled cane at the mills (dcm/inv), the average results, measured in kg/peso invested, also show similar results. The annual mean value for this indicator is 7.02 kg per peso invested during the years 1981-89, with a correlation coefficient between the two variables of 0.019 (Alvarez and Peña Castellanos, 1995, p. 9). In other words, the investment flows into the sugarcane agricultural sector did not have a relevant positive impact on the increases in production values or on the cane volumes for the industry. The three processes lacked the necessary integration. In summary, the absence of the necessary integrity in the behavior of the three parameters, the maintained increases in investment levels, and the low global efficiency of the investment process, were clear indications at the end of the decade of the 1980s of the exhaustion of the state extensive growth model being applied to sugarcane agriculture. High Use of Productive Inputs: There were absolute increases in fertilizer levels for sugarcane production, and in the indexes relative to the input of these nutrients during the 1980s (Table 2). There was a strong statistical correlation between area benefitting with balanced or nitrogenous fertilizers and volumes of sugarcane production. In the case of nitrogen, the correlation coefficient was 0.84, while it was 0.46 for balanced fertilizers. Correlation coefficients between areas benefitted with nitrogenous or balanced fertilization and agricultural yields were 0.64 and 0.57, respectively. As explained in a later section, the decrease in the availability of fertilizers since 1991 was one of the main reasons for the fast decreases in both cane volumes and yields after that year. The situation with herbicides was similar to the fertilizer case. 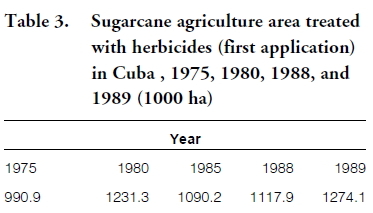 There were increases in both the sugarcane area receiving herbicides and the number of applications during the 1980s (Table 3). 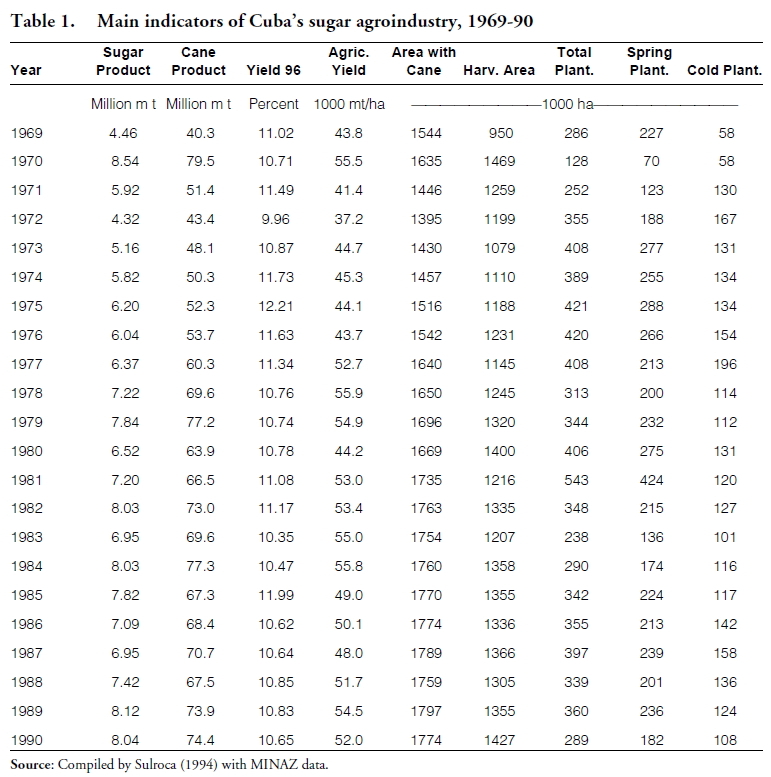 Cuban sugarcane agriculture experienced rising levels of production costs during the 1980s (Table 4). Cost break-downs by item for all the provinces and the country are not available. Such break-down, however, was available for 1988 for the province of Villa Clara, one of the main sugarcane-producing areas. As shown below in Table 5, the high hidden cost of the “other” category had a tremendous impact on the level of total costs (23% of total costs), which is intimately related to the problems of efficiency and organization at the firm level. There are many conflicting views on the role of the following elements in determining agricultural and industrial yields (Dirección de Agrotécnica MINAZ): (a) the timing of the harvest; (b) the management of the sugarcane plant; (c) the planting and replacement of sugarcane fields; and (d) the integrated control of weeds. The Timing of the Harvest: Timing of the harvest is defined as the time period between the beginning and the end of the sugarcane harvest for industrial purposes. These two dates are the subject of intense debates because of their impact on agricultural and industrial yields. The historical evidence shows that, concerning industrial yields, no date in the month of November is advisable for starting the grinding season. The reason is that, in November and still in December, the residual humidity in the soil has a negative impact on the sucrose concentration of the sugarcane, translating into low industrial yields (Table 6).It is obvious that a harvest lasting approximately 150 real days (which reflect Cuba’s climatic conditions and milling capacity) should not start before the 15th of December. (The previous statement assumes an adequate and effective organization of harvest activities under a criterion of industrial yield maximization.) When there are doubts with regards to the pace, organization, and effectiveness of harvest activities, the tendency to an early start becomes strong due to the danger of prolonging the harvest until May, or even June, which are the months with the highest rainfall in Cuba. A harvest extended into the rainy season also brings about a drastic reduction in industrial yields due to the following factors: (a) disruption in harvest activities, especially in mechanical cutting (during the 1980 decade, mechanical harvesting reached more than 70% of the harvest); and (b) lower polarization in the cane (decreasing pol in cane forces a higher harvest per ton of sugar). Nevertheless, every single Cuban sugar campaign from 1976 through 1989 (and also later), has started extremely early and finished extremely late (Alvarez and Peña Castellanos, 1995, p. 15). (a) insufficient flow of cane to the mills (subutilization of industrial capacity); (b) insufficient cane quality (low pol content); and (c) the need to grind more cane than that committed to fulfill a determined plan when actual industrial yields have been below expected yields. Rainfall is an exogenous and imponderable factor that affects the utilization of milling capacity. Outof-season rains, during the dry period between February and March, cause severe damage to plantations and result in an extended harvest beyond the month of April. In addition, problems related to organization and efficiency in harvests tasks, both manual and mechanical, have also played very important roles. The most relevant deficiencies with manual cut have been the relative scarcity of a labor force and the level of productivity of the labor force employed. Mechanical harvesting did not achieve the required levels of productivity during the last decade either. For example, on average, the real time lost in milling due to machinery and equipment break-downs fluctuated between 2.5% and 3.5% during 1981-90. The Quality of Cane: Of special importance in the Cuban case is the quality of cane delivered to the mills since this can become the unchaining factor in a progressive process of cane depopulation. In fact, an extended harvest— due to low industrial yields— extends the cutting to sugarcane areas unscheduled for harvesting under the sugar production plan. Tardy harvesting also brings about disruption of the growing and maturing months for sugarcane and, therefore, has a negative impact on agricultural yields and availability of cane of adequate maturity for the following harvest. Finally, the early harvest of cane of insufficient quality affects industrial yields of the following harvest (during the period January-April) and leads to other extensions of harvests. Such a cycle of early and late harvesting has a cumulative effect and leads, in the medium-term, to the depopulation of sugarcane areas. Management of the Sugarcane Plant: This concept includes a group of basic rules that govern the relationship between “balance area” (area planted with cane on December 31) devoted to sugarcane agriculture with an adequate and efficient organization of planting activities and the integrated care of weeds that the crop requires. In general, according to MINAZ (1990, p. 216), a sound management strategy for the cane plant must fulfill the following requirements: (a) depending on the type of cane, the age of all sugarcane harvested must fall between 12 and 22 months; (b) cold cane (early cold cane planted between July and September, or late cold cane planted between October and December), must be harvested at age 16 to 18 months, and at age 15 to 19 months only in exceptional cases; (c) the spring canes left (long cycle) ought to be harvested at age 18 to 20 months, and exceptionally at 24 months; (d) the cane stubbles (canes with three of more cuttings) should be harvested at 12 to 15 months of age; and (e) the spring canes (canes planted between the months of January and June) that had been planted between the months of May and June, must always be harvested in the following harvest (left cane, or caña quedada). An optimal management program also presupposes that the harvested area will never be above 75% of the “balance area.” When this rule is not followed, sugarcane harvested in subsequent seasons shows a decrease in agricultural yields. Furthermore, when the area harvested is beyond 85% of the area with available cane, there is a cumulative tendency to depopulation of cane areas as a result of the continuing weakening of the cane plant. The percentage relationship between harvested area and area with available cane shows some fluctuations during the period 1970-90 (Alvarez and Peña Castellanos, 1994, p. 85). Between 1971 and 1980 (1970 71 through 1979-80 harvests), this indicator had an average of 79%, which means that, in order to ensure the volumes of cane necessary for the harvest, it was necessary to cut, in some years, extensive areas with stubbles with one to two harvests, canes with less than 12 months of growth, and cold and spring canes of only 14 or 15 months of age. Such a management plan can be extremely damaging because the reiteration of early cuttings in areas of short cycles can become a degrading factor of the cane plant. Such is the case of the so-called “spring cane of the year,” of only 10 to 11 months of age, considered a cane of bad quality (MINAZ, 1990, p. 216). In 1981-85 (1980-81 through 1984-85 harvests) this indicator decreased below 75%. This was due, in part, to the intensive planting plan carried out during this period to replace the stubble affected with rust. However, between 1985 and 1989, the indicator increased again to reach 76%, and continued its increasing trend until reaching 79% during the 199092 period. 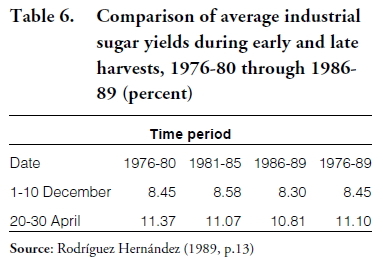 The influence that the harvesting of areas with plantings of different ages and cycles exerts on sugarcane yields can be seen from a summary of the results of a study conducted in 148 sugar agroindustrial complexes (Complejos Agro-Industriales, CAI) during the 1977-86 harvests (Table 7). It is obvious that the lowest agricultural yields were obtained from spring canes and stubbles with less than two cuts, while those from winter and long-cycle canes rendered the highest agricultural yields. In addition, when the comparison is made between cold canes (early cold canes are harvested between 14 and 18 months of age) and long-cycle canes (harvested between 20 and 22 months of age) the latter produced the best results. Planting and Replacement of Fields: The planting and replacement of sugarcane fields have an enormous influence on the behavior of agricultural yields. Planting constitutes a very complex activity that requires a sophisticated and efficient organization to concatenate links such as the selection and treatment of seed, adequate land preparation, and the quality of the planting and replanting activities. Planting is also a very costly endeavor. 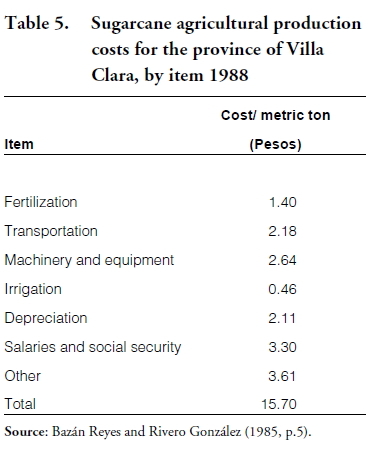 For example, during the second half of the 1980s, planting costs were estimated to be between 596 and 969 pesos per hectare (Fernández Carrasco, 1990, p. 8). Obviously, such a high planting cost (in relation to total variable costs) emphasizes the need to follow economic criteria concerning planting and stubble management and replacement. There exists an ongoing debate in Cuba concerning the programming of planting activities. In fact, the optimal planting time depends on the specific conditions of the soil type, rainfall patterns, and the availability of labor (MINAZ, 1990, p. 27). It is a known fact that, in Cuba, and because of the biological characteristics of the crop and the country’s climatological conditions, the planting of early cold cane renders higher yields (considered twice as high by many cane specialists) and lower levels of losses, than spring cane. It has been estimated that about 20% of the area planted in the spring is lost (Alvarez Dozáguez, 1993, p. 6). Spring plantings in the country, however, have been historically higher than early cold plantings (Table 1). The main reasons have been organizational difficulties in mobilizing the labor force during the months of August and September, and the difficulties of ensuring an adequate preservation of the soils prepared since April, before the May rainfalls, until the beginning of the so-called cold plantings. The preservation of the soils, even including their improvement, can be achieved through an agricultural technology of short-cycle crop rotations, the use of pre-emergence herbicides, or a combination of both. The implementation of a short-cycle crop rotation in extensive planted areas demands, of course, a complex and efficient organizational system in the agricultural sector. Until the end of the 1980s, the method of soil preservation for the early cold plantings implemented mostly in the country was agrochemical: that is, through the use of pre-emergence herbicides. The possibilities for mobilizing the necessary labor force to fulfill cold planting goals depend on the system of organization and management of the sugarcane agricultural activity, the degree of the real bond of the workers to the land, and the efficiency of the system of incentives applied. Plantings not only impact on yields because of their quality and timing. A very important aspect of the relation planting-agricultural yields, is its stubble replacement capacity. Stubbles with three or more cuttings is one of the factors that increases crop costs the most. This is due to the careful attention that they demand (number of cultural activities, fertilization regimes, intensive irrigation tasks, etc.) and to the decreasing tendency of agricultural yields year after year. As a matter of fact, the stubbles are the canes with highest costs (Acosta Pérez, 1987, p. 7) and lowest agricultural yields (Table 7). 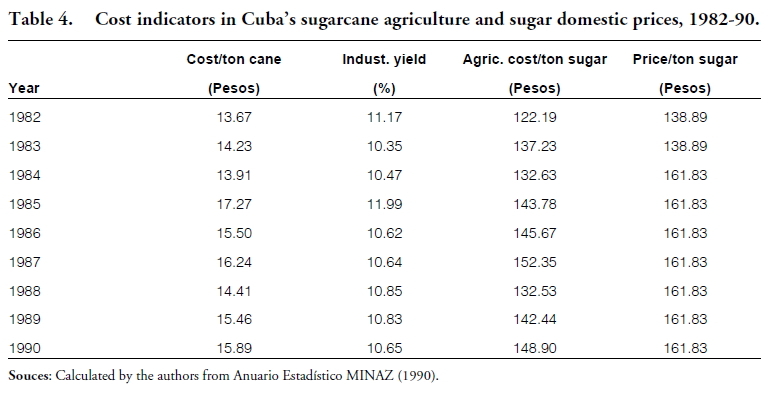 A study of 87 sugar CAIs during the 1978-87 harvests showed that sugarcane fields were not replaced according to a criterion based on optimization of agricultural and industrial yields (Fernández Carrasco, 1990, p. 8). The amount of planting necessary for stubble replacement depends on a number of factors. They include, among others, the physiological status of the cane plant, the decreasing tendency of agricultural yields due to number of cuttings and cane age, the limiting agro-technical characteristics of the soil, and the economic thresholds of costs and returns (Fernández Carrasco, 1990, p. 8). 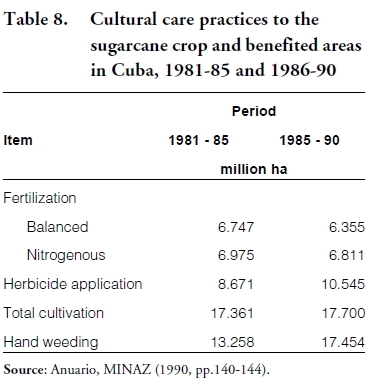 The Cuban sugarcane experience has shown that the age of cane should not exceed 7.5 years (five or six cuttings), under optimal crop care conditions (Fernández Carrasco, 1990, p. 8). Therefore, a realistic stubble replacement policy that considers the current conditions of the cane population is forced to consider shorter periods and, therefore, higher costs. Using data in various issues of the CEE Anuario Estadístico and Anuario MINAZ, Alvarez and Peña Castellanos (1995, pp. 86-88) compared areas harvested whose canes must be replaced and the annual average rate of plantings intended for field replacements (to arrive at this indicator one has to subtract from total annual plantings in new areas the total losses experienced in this activity), based on a number of assumptions. They are: under normal management replacement conditions (seven years of age with six cuttings), and, for conditions of six, five, four, and three years of age with five, four, three, and two cuttings, respectively. In general, Alvarez and Peña Castellanos (1995, pp. 86-88) have shown that the harvested area that requires replacement grows more rapidly than the average plantings intended to replace plantations in all the cases. In some instances, it is obvious that the rate of plantings can not provide the necessities of plantation replacement, which severely affects the levels of existing cane populations and, therefore, the agricultural yields of the crop. In fact, specialists consider the current stubble replacement program in Cuba to be insufficient (Alvarez Dozáguez, 1993, p. 6). The Integrated Control of Weeds: The implication of the depopulation of cane areas is, without a doubt, the unrestrained growth of weeds. Table 8 shows some data on the behavior of the items included in the indicator “cultural care to the crop” during the 1980s. The data show a considerable increase of the areas benefitted with activities included in crop care. It is estimated, however, that unrestrained weed proliferation is responsible for agricultural yield losses in sugarcane that are above 40% (Alvarez Dozáguez, 1993). A theoretical-empirical study has shown that weeds not controlled in time (between 30 and 120 days after planting or harvesting) lower agricultural yields between 37% and 66% (Alvarez Dozáguez and Acosta Pérez, 1985, p. 1). The situation concerning the integrated weed control program in the first years of the decade of the 1990s has not improved. In fact, in 1992, the area benefitted from crop care activities during the first semester of the year was only of 2.55 million hectares, or less than half the average of the last years of the 1980s (Alvarez Dozáguez, 1993). All main indicators of sugarcane agriculture and industry have been deteriorating rapidly in the last few years. In fact, the demise of socialism in the Eastern European countries and the former Soviet Union, and of the Council for Mutual Economic Assistance (CMEA), represented the elimination of the main framework within which Cuba’s economic relations were taking place. At the end of the 1980s, Cuba was conducting around 81% of its external commercial relations with the member countries of CMEA. This group of countries was importing the bulk of Cuba’s total exports (63% of sugar, 73% of nickel, 95% of citrus), and was the origin of around 85% of Cuba’s total imports that included 63% of food, 86% of raw materials, 98% of fuels and lubricants, 80% of machinery and equipment, and 57% of chemical products (Alvarez González and Fernández Mayo, 1992, pp. 4-5). Furthermore, the trade relations between Cuba and the CMEA took place under conditions favorable to Cuba. 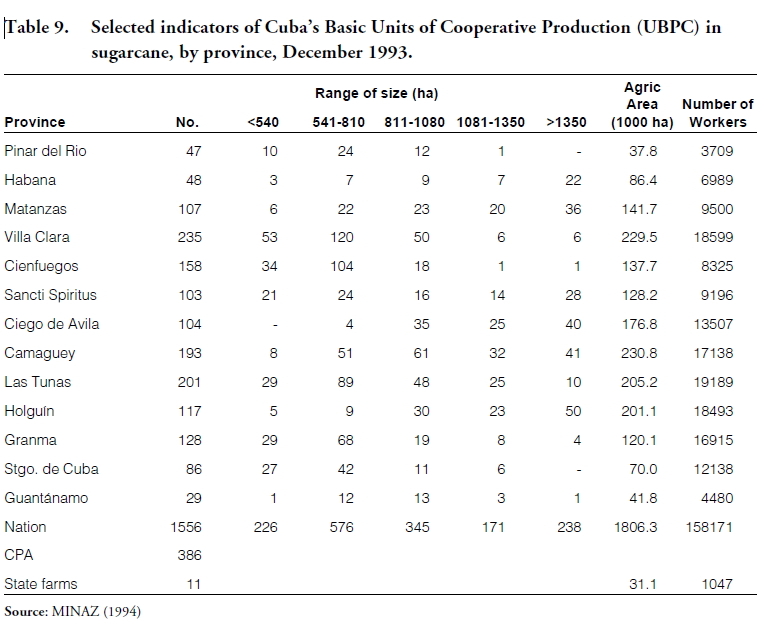 For example, it has been estimated that, during the 1981-90 period, Cuba had earnings from sugar exports about 50% higher than would have been obtained at world market prices (Alvarez González and Fernández Mayo, 1992, p. 4). The direct impact that the demise of socialism in the above-mentioned countries and the CMEA had on the Cuban economy becomes more obvious when comparing Cuban imports statistics for 1989 and 1992. In 1989 Cuban imports reached over 8 billion pesos, while in 1992 the figure was 2 billion pesos, for a decrease in value of more than 70% in only three years (Alvarez González and Fernández Mayo, 1992, p. 8). A reduction of such magnitude necessarily and severely affects the economic and social activity of the country. In the case of sugarcane agriculture, the inputs and equipments experiencing the most severe restrictions due to the fall in imports are: potassium chloride, ammonia, herbicides, potassium sulfate, ammonium sulfate, triple superphosphate, urea, cane loaders, irrigation motors, agricultural tools, towing equipment, tractors (crawler and with rubber tires), etc., in addition to fuel and lubricants, spare parts, and many others that also impact on the whole economy. Sugarcane and sugar production have fallen drastically from 1989 through 1995. Although such decreases have been the result of several factors, the most severe problem that Cuban sugarcane agriculture is facing today is the depopulation of cane areas. In only five years, sugarcane areas diminished by 10% and harvested areas by 15%. This depopulation is not only obvious from a diminishing number of available areas. The sharp decrease in agricultural yields under conditions of decreasing harvested areas (30% in only three years), is a clear sign of the decreasing and weakening of existing plantations (Alvarez and Peña Castellanos, 1995, p. 29). In that regard, it is conservatively estimated that, at present, 30% of the areas under cultivation are depopulated (Alvarez Dozáguez, 1993, p. 6). The depopulation of sugarcane areas is the main reason for the decrease in cane volumes delivered to the industry. In fact, between 1990 and 1993, cane harvested decreased by almost 50%, or from 75 to 42 million metric tons. The weakening of the plantations also surfaced in the quality of the sugarcane harvested. Data on industrial yields show a 1% decrease between 1988 and 1993, which translates into considerable losses in pol levels (Alvarez and Peña Castellanos, 1995, p. 29). Two main reasons account for the situation just described: (a) the deficient integrated care to the crop explained above, which is inherent to the state extensive growth model and to the forms of organization and management that were in place in the Cuban sugarcane agriculture for more than twenty years; and (b) the impact that the demise of the socialist system in Eastern European countries and the former Soviet Union had on the Cuban economy. Law-Decree No. 142 of 20 September 1993 dictated the established of UBPCs for the fulfillment of the following goals: (a) to achieve a closer relationship between man and working place; (b) to channel the cooperative efforts of the workers and their families in the improvement of the living conditions of the collective, including self-sufficiency; (c) to closely and rigorously relate the workers’ earnings to the production achieved; and (d) to develop the autonomy of management of the collective on their resources with the objective of achieving self-sufficiency in the productive process (MINAZ, 1993b, p. 3). Related to Law-Decree 142, the Sugar Ministry enacted its Resolution No. 160-93 eight days later, which contained the “General By-Laws of the Basic Units of Cooperative Production in Care of MINAZ” (MINAZ, 1993b, p. 6). Under Articles 1, 2, and 3 of the By-Laws, the UBPCs are: (a) part of the production system of a CAI, constituting one of its primary links; (b) directly related to the CAI without intermediate organizations; (c) the owners of the production and of the basic means they purchase on credit; (d) allowed to sell their production to the CAI and to have management autonomy over their productive and monetary resources; and (e) fundamentally established with the sugarcane farmers that are related through work to the lands intended for their creation and that voluntarily express their wish to belong to this new form of sugarcane organization (MINAZ, 1993b, pp. 9-10). In all UBPCs, once the economic cycle is finished, and with prior estimation of total revenues, payments will be made for assets acquired at the time of its establishment, fulfillment of the responsibilities acquired by receiving loans, taxes, and other expenditures generated during the productive process. Once the remaining total balance is determined, up to 50% of such balance can be distributed among the members, and the rest must go into a reserve fund for its utilization in the following areas: contingencies, acquisition of basic and rotational means, house buildings, construction of productive and social installations, incentives, and others, with prior approval of the General Membership Assembly. The hiring of seasonal workers by the UBPC, with the funds it autonomously administers, is allowed (MINAZ, 1993b, 20-21). The Board of Directors of each UBPC is composed of nine members: the Manager, the Chiefs of Economics, Production, Services, Machinery, Parcels, and the Principal Engineer, and two other UBPC members. The similarities between the Agricultural Production Cooperatives (CPA) and the UBPC are obvious. The economic frameworks, as well as the means of collective and individual remunerations, are very similar. The only exception, of course, is land ownership in legal terms: the CPA is the owner of its land while the UBPC receives the land in usufruct from the state for an indefinite period of time. Once the establishment of the UBPCs in sugarcane agriculture was approved, an accelerated process of change took place in the sector. By the end of 1993, less than three months later, practically all state lands devoted to sugarcane production were reorganized under this new form of management and direction, and more than 98% of the cane agricultural workers became cooperative members (Table 9). The conversion of state farms into UBPC not only was a structural change but also meant a transformation of land distribution from the standpoints of growing, producing, and managing the cane. According to MINAZ (1994), at the beginning of 1993, there were approximately 734 sugarcane farms with a gross cane area of 1.3 million ha and a net area of 1.2 million ha. Under such circumstances, the average agricultural area per farm was 1825 ha, 1665 of which were specifically devoted to sugarcane. By December 1993, 1.2 million ha of the total state agricultural area, approximately 93%, was shifted to UBPCs, with 1556 such units already established. This translated into an average agricultural area of about 799 ha per UBPC (a reduction of 56% in relation to the area under control by the state farm), of which, and on the average, 710 were devoted to sugarcane. The UBPCs have an average of 11.42 ha per worker, while the remaining state farms in sugarcane have almost 30 ha/worker. It is still early for evaluating the effectiveness of the UBPCs. Nevertheless, it is important to keep in mind that they developed at a particularly critical moment for both the sugarcane sector and the Cu ban economy as a whole. For that reason, spectacular results in the short-run should not be expected. There exists, at present time, an internal debate in Cuba about the UBPCs, their structure and economic and productive performance, their degree of autonomy, their incentive mechanisms, their relationship with the CAI, and many others. For example, the debate includes the pricing mechanism that will be applied to sugarcane production during the next harvests to stimulate agricultural yields. In reality, a proposal has been put forward to apply a system similar to the one in the CPAs, based on a differential price system according to yields (MINAZ, 1994). The most contentious debate relates to the degree of autonomy of the UBPC from the CAI, and the relationship of the UBPCs with suppliers and with other coops and state enterprises. There is a general consensus among UBPC, CAI, and MINAZ, of the need to improve the mechanisms of autonomous management in the UBPCs, such that these could exert, in practice, a greater control of their resources according to their collective interest and in correspondence with the objectives for which they were established: the sustained development of sugarcane agriculture (MINAZ, 1994). The process of the establishment of the UBPCs is still in its infancy, and it is possible that their development will be slow and long. 6 But the UBPCs are already a transcendental fact. The UBPCs are a new modality of organization and management in both sugarcane agriculture and Cuban agriculture in general, implemented within an extremely complex economic framework, both in terms of the global potential of the country’s economy and the external context within which it has to function. In that regard, the UBPCs are a necessary alternative to the new conditions facing the Cuban economy but they are also an irreversible alternative. During the 1980s, Cuba’s sugarcane agriculture developed following a state extensive growth model characterized by the utilization of extensive agricultural areas, heavy use of productive inputs, high capital investments, and increasing costs. However, during that period, agricultural yields were far below the country’s potential, which unveiled the existence of relevant deficiencies in the integrated care to the crop that the model could not overcome. The specific forms of organization and management of the sugarcane agricultural activities have an extraordinary importance in ensuring cane volumes sent to the mill, in the behavior of agricultural and industrial yields, and in the general efficiency of the agro-industrial activity. In that regard, the performance of the state extensive growth model was less than satisfactory. The newly-created UBPCs, although still in their infancy, may help in solving, or at least mitigating, the problems that the state extensive growth model could not resolve. At the same time, the prohibition of foreign investment in the sugar sector has been lifted by the Cuban government. Perhaps these two policy changes will bring about some needed relief to Cuba’s sugarcane and sugar industries. Acosta Pérez, Pedro P. “Combinación entre la lluvia, su distribución y organización, y el manejo de cepas en la agricultura cubana.” Havana: Agrotechnical Direction, Sugar Ministry, 1987. Alvarez, José. “Cuba’s sugar industry in the 1990s: Potential exports to the U.S. and world markets,” Cuba in Transition— Volume 2 (1992): 133-151. Alvarez, José, and Lázaro Peña Castellanos. “Preliminary study of the sugar industries in Cuba and Florida within the context of the world sugar market,” International Working Paper IW95-6, Food and Resource Economics Department, Institute of Food and Agricultural Sciences, University of Florida, March, 1995. Alvarez, José, and Ricardo A. Puerta. “State intervention in Cuban agriculture: Impact on organization and performance,” World Development, 22:11 (1994): 1-13. Alvarez Dozáguez, Armando. “Caña de azúcar: La materia prima más deficitaria hoy en la patria de Alvaro Reynoso.” Documento ATAC. Havana: Cuba’s Association of Sugarcane Technologists, 1993. Alvarez Dozáguez, Armando, and Pedro Pablo Acosta Pérez. “Resultado del control de hierba en CAI Pablo Noriega en los años 1977-1984.” Documento MINAZ. Havana: Sugar Ministry, 1985. Alvarez González, Elena, and María Antonia Fernández Mayo. “Dependencia externa de la economía cubana.” Documento INIE. Havana: Institute of Economic Research, National Planning Board, 1992. Bazán Reyes, Adriana, and Oscar Rivero González. “El perfeccionamiento estructural y el funcionamiento de las brigadas permanentes de producción.” Villa Clara: Department of Industrial Engineering and Economics, Central University of Las Villas, 1985. Comité Estatal de Estadísticas (CEE). Anuario estadístico de Cuba. Annual issues. Havana: Editorial Estadística. Dirección de Agrotécnica MINAZ. “Cartas tecnológicas— manual de procedimiento.” Havana: Sugar Ministry, 1983, 1985. Fernández Carrasco, Miguel. “¿Ciclo largo o corto de cosecha?” Tribuna del Economista, (March 1990). Forster, Nancy. 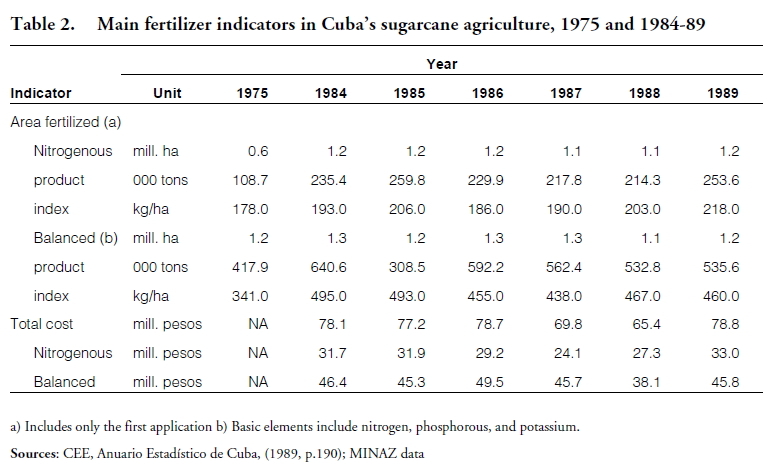 “Cuban agricultural productivity,” in I.L. Horowitz (Ed. ), Cuban Communism. New Brunswick, NJ: Transaction Publishers, 1989, pp. 235-255. Fry, James. “Cuba’s sugar statistics: How reliable are they?,” Cuba Business (London), 2:2 (April 1988): 8-10. MINAZ. Anuario Estadístico MINAZ. Annual issues. Havana: Sugar Ministry. MINAZ. “Consideraciones generales sobre el sistema de estimulación por los resultados finales de la producción para las granjas cañeras.” Documento MINAZ. Havana: Sugar Ministry, 1993a. MINAZ. “Documentos en torno al perfeccionamiento de las UBPC, Diciembre 1993-Junio 1994.” Documentos MINAZ. Havana: Sugar Ministry, 1994, various issues. MINAZ. “Documentos sobre la creación y perfeccionamiento de las unidades básicas de producción cooperativa.” Documentos MINAZ. Havana: Sugar Ministry, 1993b. MINAZ. “Manual técnico para el cultivo y cosecha de la caña de azúcar.” Havana: Sugar Ministry, 1990. Nova González, Armando. “Importancia de la economía agrícola en Cuba: La agroindustria azucarera.” Documento INIE. Havana: Institute of Economic Research, National Planning Board, 1990. Rodríguez Hernández, Julio L. “Breve análisis sobre la problemática de las zafras azucareras en Cuba.” Documento MINAZ. Havana: Sugar Ministry, 1989. Sulroca, Federico. “La agricultura cañera y su papel en la eficiencia agroindustrial azucarera en Cuba.” Paper presented at the Provincial Encounter of the ATAC, Havana, November 1990. Sulroca, Federico. Statistics provided with MINAZ data, 1994.